The ability to access various devices remotely is becoming an integral part of our everyday life. More and more people tend to avoid using long cables and adapters, opting for wireless technologies. Some devices are originally designed to work across the network, while others do not support this option. Recently I’ve discovered a unique offer in the software market – FlexiHub. The program lets users connect to any USB device remotely. The software version for Windows allows remote access to RS232 as well. According to the developers of the app, with that solution my local computer would be able to recognize any remote device as physically attached to the PC. That’s what I decided to test with my brand-new MacBook with a single USB-C port. At home I also have Mac mini running macOS Sierra. The machine has several USB ports, so I connected my home printer to one of them. I chose the version of the app for Mac on the software download page and once the app was downloaded, I installed FlexiHub on both my Mac and MacBook. It is also worth mentioning that the app supports all popular platforms. Unfortunately, FlexiHub is not compatible with iOS yet, but it’s already possible to use the software on Android OS. 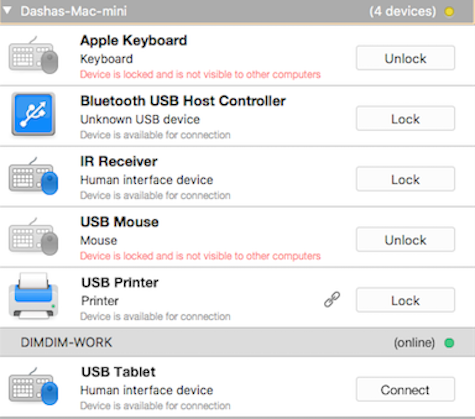 Once I finished with the software installation on my Mac mini, I logged into my FlexiHub account (the one I created when registering on the app’s website). In just a few seconds I had all the peripherals attached to my machine displayed in the software interface. What’s interesting is that the app lets users ‘Lock’ peripherals if you don’t want them to be accessed remotely by other people over the network. In case a device isn’t locked, it gets shared over the network automatically. I then started FlexiHub on my MacBook and entered the software account with the same login credentials I used on the Mac mini. 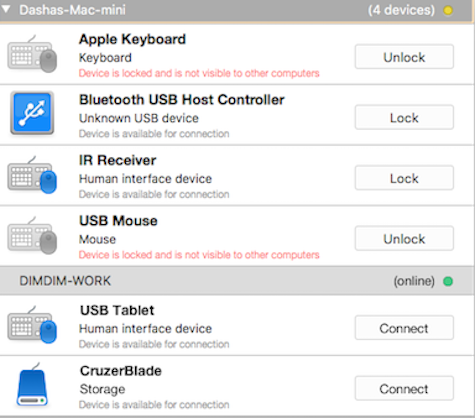 In the app’s interface I saw all the devices plugged into my Mac mini. 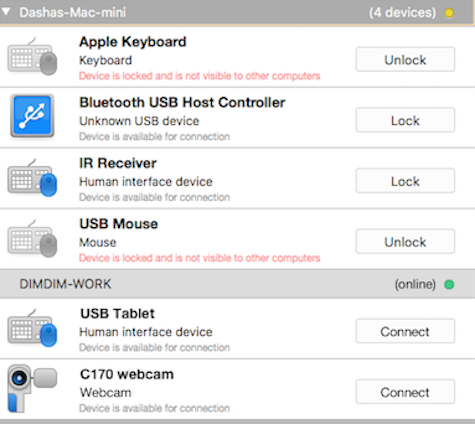 All of the peripherals were available for remote access, so I could easily connect to them from the MacBook. Then, to make sure the software capabilities are not limited by distance, I went to the nearest park and tried managing my home printer from my MacBook over the Internet. It worked! Later, I accessed a remote scanner of my friend and a USB dongle attached to my office computer in the same way. Impressive, all of it. One more thing about FlexiHub that deserves particular attention is the ‘Invite’ feature. With this option you can invite other users to access your local devices. All you need to do is select the required peripheral from the list in FlexiHub’s interface and click on the link icon next to the device name. After that, you enter the email of the person you’d like to share the device with and hit ‘Send invite’. As soon as the person accepts your invite, the peripheral will be redirected to their remote machine and recognized by their computer like it was physically attached to the PC. I tested this feature with my home webcam and Windows computer located in my office. I just created a separate FlexiHub account on the office PC and downloaded software version for Windows OS. FlexiHub’s performance deserves a high score. The remote access functionality works perfectly. This app’s compatibility with different platforms and its ability to invite other users to interact with remote devices are important advantages of the software.